Made this video throughout the past few days. Hope it helps! I'd like to thank Shade Of Eclipse for helping me with extra information. Interests:Inverts, herps, fish/fishing, hiking, shooting and pretty much anything else that gets me outdoors! Nice video! I started fermenting an entire bag of Traeger oak pellets on the 15th of last month. I used a 20 pound bag of pellets, 5 pounds of unbleached whole wheat flour and 3/4 ounce of yeast. When everything was mixed it expanded to roughly 70 liters, though volume has started to decrease due to fermentation. I can't believe how hot it gets! I checked the temp before mixing it last night and it was just shy of 130 degrees! Perhaps that's just because I'm doing such a large batch all at once. So far there are some things I've noticed. When using wheat bran, I'm not getting the wine smell you would get with yeast and flour. It smells like an old house and doesn't generate a lot of heat. I know Daniel Ambuehl uses bran too but has bags he puts them in where the substrate can breathe. Also, when fermenting white birch it smells different than usual. It takes a while to get dark and smells like dirty socks. It's a pungent odor! Just thought I'd share some extra notes here. Alright guys, so I checked up on my substrate today and this picture is the end result. It is a nice dark color and has an earthy smell. I noticed that the substrate with wheat bran in it fermented faster than the one with flour in it. The buckets with the flour in it did not ferment all of the way. Question~ Do you spray water on it to keep it moist? I'm sure it depends on how you keep it. 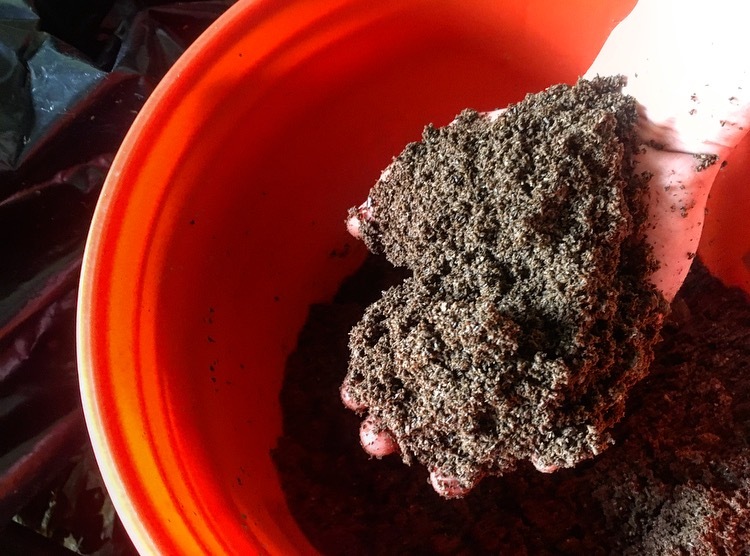 If you're using the breathable bags and you might need to, but if you're using the tub or tumbler method then you should be ok. Decaying materials will generate a bit of moisture on their own, and it will collect in the box. Very rarely I will dump a bit of warm (not boiling) water into my fermenting sub and give it a good mix, but only if it is drying out and needs it. Thanks~ I essentially keep the box open to ensure the yeast can breath right? I'm sure that could work if you live somewhere humid, but I don't, so I close mine. I split my batches into two 18-gallon bins, so each is only about halfway full, and also poke divots into the top of the sub after each mix to increase surface area. With the bins only about halfway full, and the daily mixing, there is plenty of oxygen available for the fermenting process. How long does it take to start heating up? I just started mine yesterday and its not very warm at all. Perhaps so, it has been 48 hours already and it's not very warm at all -- I used a mixture of whole wheat flour and bran for the recipe. Perhaps the yeast I bought was bad? It may be my temperature though, since it has been low 60s outside, with my room being slightly warmer. I have a hard time telling if there is a "wine" or "rotten" smell as the oak smell is very overpowering for my nose. It does seem to have an acidic smell at least though, but that might just be the tannin from the wood pellets? It's been heating up pretty well now - and I'll try to keep the room a bit warmer as you said. Theres been a lot of white mold growing on the side of some of my buckets. Should I break it up or leave it alone? I know it's said to mix compost up to promote aeration, but I'm not sure if this mold growth is beneficial or not. Should I promote its growth or?? The substrate stopped heating up for some reason -- also a lot of mold grew in some of my buckets. What should I be doing to fix this? I was constantly mixing it until it started to mold too quickly and made me nauseous and lightheaded from all the mold when I mixed... I eventually did mix it and most of the mold is now gone because I guess most of the nutrients and excess moisture has left. When do you know if the fermented wood is safe to give to your beetle grubs? I know there is some danger of heat from compost killing them and some other stuff, but I'm new to this. I know the video says its mostly the color, but are there other ways to tell to double check? Also if you were to use the fermented wood for dynastes tityus would it be okay to give them wood that isn't completely fermented and more in lines with what a stag would want? Rhinos like D tityus typically won't do well on wood that isn't thoroughly fermented. Color and smell are the two biggest indicators of being done. The color should be dark brown, the sub shouldn't be generating any heat, and it should smell earthy like soil, not sour or like wine or wood. If your sub is still a light brown or even tan, fully cooled down, and it's been a 4-6 weeks or so, it's not uncommon to have to re-ferment it (basically introduce new flour/bran and yeast in the same ratios as when you started). You'll want to go back to daily mixing when you do this if you've stopped at all, that is. My biggest piece of advice is to not try to rush it. You can't. Fermenting any time outside of summer is torturously slow (for me, at least) due to the cooler temps. My first batch of sub was done indoors at around 72f using flour and took about 8 months to reach a state acceptable for rhinos. For the love of Beetle Jesus, though, wear a mask or respirator rated for bio particulates (they're pretty cheap) and gloves when you mix, especially when there is mold present. That is indeed good advice PowerHobo. Also, I'm a bit confused at which color it is indicated to be in need of refermentation. My substrate is a bit dark brown when moist, but it is not nearly as dark as compost but is much darker than raw oak wood. However, it does look a bit tan when dry. Also, when the book "For the Love of ....." refers to foul odor, is it referring to the odor of just fermentation or general odor like from mold?